On January 1, 2011, few would have predicted that Egyptian dictator Hosni Mubarak would soon be removed from office. But just three weeks later, thousands of Egyptians gathered in Cairo’s Tahrir Square to begin the push for change. In the aftermath of Tunisia’s political shakeup, Egyptian citizens called for an end to the authoritarian regime that controlled their lives. Never before had Mubarak faced such a massive challenge. After decades of torture, corruption, and fraudulent elections, the Western world’s favorite “moderate” dictator was about to be removed from power. Looking back, there were key underlying political conditions that made this popular revolt possible. After enduring some twenty-five years of dictatorship, Egyptian activists had already broken the taboo of publicly challenging Mubarak’s regime in 2004 and 2005. And with the dictator’s ailing health, the Egyptian public faced the specter of a 2011 handoff of power from the father to his son, Gamal Mubarak. Trapped between a dictator and the heavy U.S. investments that supported his regime, the Egyptian public was ready for the Tunisian spark that inspired them to action. The factors leading to Hosni Mubarak’s overthrow were rooted, of course, in the three decades of his repressive rule. For thirty years, the aspirations of the Egyptian public were held captive by a government that appeared invincible through a combination of ruthless tactics at home and heavy military support from its U.S. sponsor. At home, Hosni Mubarak used a range of tools to maintain his regime, from outright repression to the skillful manipulation of domestic opposition. The primary tools for this control were the government’s state of emergency laws. Put in place decades ago, these laws enabled the Mubarak regime to ban public demonstrations, disperse political meetings, shut down media outlets, and make arrests without charges (Washington Post 2010). In addition, torture and sexual violence were commonly used against dissenters of diverse political stripes. Targeted dissenters ranged from secular democracy activists to the thousands of members of the Muslim Brotherhood who were held in Egyptian prisons (Shatz 2010). Alongside this domestic legacy of brutality, the U.S.-Mubarak alliance also played a significant role in stifling the aspirations of the Egyptian public. That alliance began with Mubarak’s rise to power in the aftermath of the 1981 assassination of his predecessor, Anwar Sadat. In the years since, U.S. military aid to the Mubarak regime rose to some $1.3 billion a year, or 25 percent of the dictator’s military budget (Cook 2009). Even nonmilitary U.S. aid strengthened Mubarak’s regime by respecting the regime’s restrictions on which Egyptian nongovernmental organizations (NGOs) could get U.S. funds (McInerney 2010). Though U.S. support often came with official calls for democratic reform, actual U.S. aid remained unaffected by Mubarak’s continued repression. In economic terms, this thirty-year U.S.-Mubarak relationship came at great cost to the Egyptian people. Under Mubarak’s regime, nearly half of Egyptians have lived in poverty. Prior to the 2011 protests, real unemployment stood at approximately 26 percent, and 40 percent of Egyptians continued to live on $2 a day or less (Shatz 2010). The Egyptian government had failed the fundamental test of providing its people with an economy that met their basic needs. To the extent that U.S. support for the Mubarak regime gave the government a domestic aura of permanence, U.S. policies also share some responsibility for the continuing economic suffering of the Egyptian people. While the Egyptian public had fared poorly under Mubarak’s rule, U.S. geopolitical goals historically benefitted from this alliance. This promotion of U.S. foreign policy at the expense of the Egyptian public was yet another factor in the alienation of the Egyptian people from their government. It is also a significant reason why there is a great deal of criticism toward U.S. foreign policy within Egyptian civil society. In return for U.S. military and financial aid, Mubarak’s regime gave significant diplomatic and political support for U.S. policies in the Middle East. As stated in a recent memorandum by the Council on Foreign Relations, “Cairo has historically provided Washington with political cover as the United States seeks to achieve its goals in the region” (Cook 2009). One example of this is the unacknowledged use of the West Cairo airbase as a refueling station for U.S. military aircraft en route to Iraq (Shatz 2010). Other forms of support included the U.S. rendition of terrorist suspects to Mubarak’s torture-friendly cells. The most significant impact of U.S. aid to the Mubarak regime was that it bent Egyptian policy in the direction of supporting Israeli goals. With Mubarak’s border cooperation, for example, Israel could continue its blockade of Gaza Palestinians and Hamas. The Egyptian government even began building a deep barrier at the Egypt-Gaza crossing to block the tunnels through which Egyptian and Palestinian merchants evaded the Israeli blockade. The United States had approved an additional $50 million in border security aid for Egypt, possibly to fund this wall (Shatz 2010). Such cooperation has been lauded by Israeli officials as necessary for the moribund “peace process” with the Palestinian Authority. But in reality, this relationship with an Egyptian dictator may simply have given successive Israeli governments the freedom to continue building settlements on what is left of Palestinian land in the West Bank. Mubarak’s support for Israeli policy served his regime’s domestic interests as well, because Hamas is ideologically allied with Egypt’s Muslim Brotherhood, the mass-based Islamic movement that has opposed Mubarak’s dictatorship. However, this support for Israeli policies was dependent on a continued Egyptian dictatorship, because Egypt’s Arab majority has been highly critical of Israeli treatment of Palestinians. A democratically accountable Egyptian government would never have been able to provide such extensive support. Against this backdrop of repression, poverty, and disempowerment, a wide spectrum of domestic opposition voices offered competing visions of reform. The Mubarak regime long benefitted from the fractured diversity of these voices, which differed in ideology, resources, tools, and tactics. The Mubarak regime maintained power by exploiting the fault lines between the different groups. These fault lines included poor versus rich, religious versus secular, conservative Islam versus Coptic Christian, and banned organizations versus officially registered parties. When such exploitation wasn’t enough, government torture and the state of emergency laws ensured that the public square could be kept empty—or at least under control. One major source of anti-Mubarak opposition has been the Muslim Brotherhood. The organization has historically contained a range of ideological currents and occupied different roles in Egyptian society. Critics point to jihadi advocate Sayyid Qutb, who emerged from Egyptian imprisonment and torture in the 1960s to call for violence against the state. He was hung by the Nasser regime in 1966. But by 1970, the Muslim Brotherhood had explicitly debated the use of violence and renounced it (Guttman 2011). Officially, the Muslim Brotherhood has been a banned entity under the Mubarak regime, and thousands of Muslim Brotherhood activists remain in prison. In practice, however, the organization has a strong network across the nation’s mosques and community religious institutions. Muslim Brotherhood politicians have also held seats in the Egyptian parliament though as “independents” and only in tokenized numbers that enabled the Mubarak dictatorship to point to a diversity of opposition voices. Even this token representation was eliminated in the fraudulent 2010 elections, which could be interpreted as a consolidation of Mubarak’s power before a possible transfer to his son. All of this demonstrates the complex relationship that existed between the Muslim Brotherhood and the Mubarak regime (Shatz 2010). Under a potential transition to democracy, it has been estimated that the organization would win 15 percent to 20 percent of seats in parliament (Guttman 2011). On the other end of the opposition spectrum are the officially registered opposition parties that were historically allowed by the Mubarak regime to seek and hold office in parliament. These parties, however, have been weak and proscribed in the levels of public outreach they were allowed. They include the Wafd, Tagammu, and other Nasserist parties (Elshobaki 2010). Because of the limits they faced, they were ineffective vehicles for challenging the antidemocratic nature of the state. At best, they served as small reminders that Hosni Mubarak’s National Democratic Party faced opposition within the broader Egyptian society. At worst, they provided the Mubarak regime with a tool of legitimation through which it could point to the presence of opposition parties as proof of the regime’s democratic character. Mubarak’s careful management of the official opposition was one reason why the mass protests of 2011 were relatively organic and leaderless in origin: the official opposition has lacked a grassroots base. Somewhere between the grassroots power of the Muslim Brotherhood and the isolated position of officially recognized opposition parties are an array of secular democracy advocates, individual opposition voices, and others. They have tended to be disconnected from Egypt’s majority of urban and rural poor who grapple with day-to-day struggles for survival. As a consequence, they lacked the political firepower on their own to mobilize voters or pose a significant threat to the Mubarak regime. This was yet another reason why, when Egyptians took to the streets on January 25, they did so without the dominant banner of a preexisting movement. In 2004 and 2005, leading opposition voices came together for the first time to publicly challenge the Mubarak regime. Under the banner of Kefaya—Arabic for “enough”—opposition voices ranging from Islamists to secular reformers publicly called for an end to Mubarak’s government. The trigger was the looming 2005 “election” through which Mubarak was expected to renew his rule. The Kefaya movement was a breakthrough moment in Egyptian politics because it was the first time that sectors of the public were comfortable challenging the regime directly. To be sure, the Kefaya movement did not achieve its goals but it did lay the foundations for the bolder protests of 2011. The movement faced significant government hostility, and the regime used many of its tools of repression to silence the activists involved. Women activists were publicly raped by security forces, plain-clothed officers beat protestors at demonstrations, and the government-controlled media attempted to delegitimize the movement by accusing it of being a tool of the United States (Oweidat et al. 2008). Interestingly, the movement also faced criticism from Al Qaeda’s Ayman al-Zawahiri, who publicly assailed Kefaya for pursuing a nonviolent challenge to the Mubarak regime. The Kefaya movement, including its Muslim Brotherhood members, rejected the Al Qaeda criticism (Oweidat et al. 2008). Ultimately, the movement crumbled under both the pressures of the Mubarak government and its own internal tensions. The Mubarak dictatorship skillfully elevated issues that heightened tensions between Kefaya’s secularists and Islamists, such as a government minister’s criticism of hijab. Still, Kefaya opened the door to broader public criticisms of the Mubarak government. In the aftermath of the movement’s decline, labor activism became a significant form of popular protest against the Mubarak regime’s economic policies (Oweidat et al. 2008). At a more fundamental level, Kefaya broke open the gates of public criticism toward the Mubarak regime. By 2010, many perceived Mubarak to be laying the groundwork for succession by his son, Gamal Mubarak. At a time when his father was widely assumed to be in the final years of his life, Gamal began rapidly advancing through the ruling structures of the dictatorship’s National Democratic Party. As a relative newcomer to the circles of power, the son’s rise triggered opposition from sectors of the public that openly criticized the notion of hereditary rule in Egypt. Fear of a hereditary renewal of the dictatorship was probably one important factor in preparing the Egyptian public for the direct protests of 2011. Gamal Mubarak also faced the perception that his economic liberalization agenda benefited elites while causing additional hardship for those who were poor. The consolidation and transfer of Mubarak’s power was expected to come over two rounds of elections: a November/December 2010 vote for parliament and a September 2011 vote for the presidency. If there was any hope that these elections would provide an opportunity for a democratic transition, that hope was dashed on the way to the November 28, 2010, first-round parliamentary elections. Prior to that “vote,” the Mubarak regime conducted mass arrests and placed major restrictions on public campaigning (Human Rights Watch 2010a). Following the completion of parliamentary elections, Mubarak’s National Democratic Party swept most of the 508 seats in parliament, and the Muslim Brotherhood went from holding one-fifth of the seats to holding none. Mubarak’s emergency law enabled the regime to disrupt many of the basic activities necessary for free and fair elections (Human Rights Watch 2010b). In addition, the regime selectively allowed certain opposition voices to register as official parties while denying truly prominent opposition movements the ability to organize democratic challenges to the state. Generally, if a political party was allowed to be “officially registered,” it was because it was not a political threat to the regime. Against this backdrop, the swift popular overthrow of Tunisia’s dictatorship in January inspired countless Egyptians to consider similar possibilities for their own nation. Just six years earlier, the Kefaya movement had already broken the taboo on directly challenging the Mubarak regime. With Mubarak in the final years of his life, the looming possibility of a hereditary transfer of power to his son caused further offense to many Egyptians. It was in this environment that former International Atomic Energy Agency Chief Mohamed El-Baradei became one focus for Egyptians seeking an alternative to the perpetuation of their dictatorship. At the time of this writing, the Egyptian protesters have emerged victorious in their campaign to drive Hosni Mubarak from power, but it remains to be seen whether their interim military rulers will follow through on a meaningful embrace of democracy. The United States can help by remaining publicly committed to a full democratic transition. As described by Human Rights Watch (2011), such a transition should be “inclusive, credible, transparent, and accountable.” Not only that, but the interim military government should also move quickly to dismantle the Mubarak dictatorship’s tools of repression: political imprisonment, torture, and the emergency laws. The Egyptian people have suffered greatly under thirty years of U.S.-backed dictatorship. The end of Mubarak’s regime offers both the Egyptian people and the U.S. government an important opportunity to break decisively with this past. Cook, Steven A. 2009. Political instability in Egypt: Contingency planning memorandum no. 4. Council on Foreign Relations, August. Elshobaki, Amr. 2010. 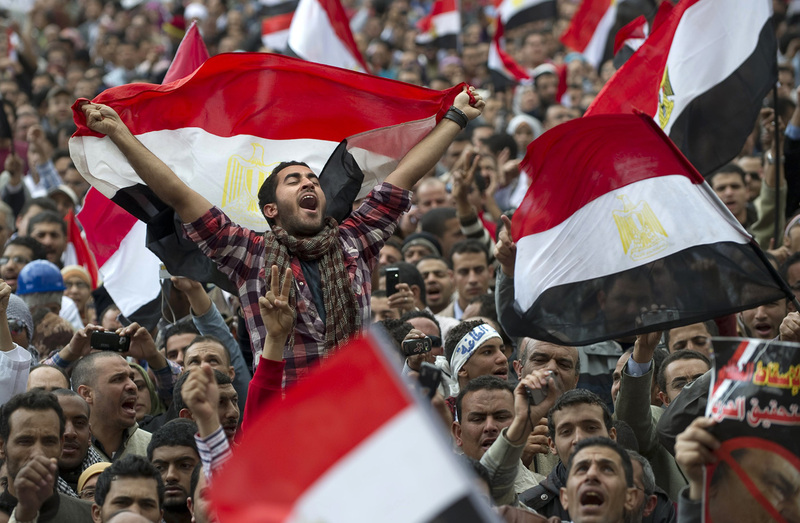 Parties, movements, and prospects for change in Egypt. Arab Reform Bulletin, May 20. Washington, DC: Carnegie Endowment for International Peace. Guttman, Nathan. 2011. Muslim Brotherhood: In Egypt, a pragmatic player, but less likely to rule. The Jewish Daily Forward, February 9 (www.forward.com/articles/135318). Human Rights Watch. 2010a. Egypt: Systematic crackdown days before elections. Human Rights Watch, November 24. ———. 2010b. Elections in Egypt: State of permanent emergency incompatible with free and fair vote. Human Rights Watch, November 23. ———. 2011. Egypt: Free detainees, lift emergency, end torture. Human Rights Watch, February 14 (www.hrw.org/en/news/2011/02/14/egypt-free-detainees-lift-emergency-end-torture). McInerney, Stephen. 2010. Shifts in U.S. assistance to Egypt alarm democracy advocates. Arab Reform Bulletin, April. Washington, DC: Carnegie Endowment for International Peace. Oweidat, Nadia et al. 2008. The Kefaya movement: A case study of a grassroots reform initiative. RAND National Defense Research Institute. Shatz, Adam. 2010. Mubarak’s last breath. London Review of Books 32(10), May 27. Washington Post. 2010. Egypt’s Mr. Mubarak moves to lawless repression. Washington Post Editorial, November 5. Sanjeev Bery is a 2011 Mid-Career Master in Public Administration candidate at the John F. Kennedy School of Government at Harvard University, focusing on organizational management and international affairs. He is a founder of Freedom Forward (www.freedomforward.org), an organization dedicated to ensuring that U.S. foreign policy lives up to the American values of freedom and democracy.